"The agreements and cooperation projects reached between Syria and Iran have a strategic dimension and form a strong economic base that would contribute to enhancing the steadfastness of Syria and Iran in the face of the western-led economic war targeting the two countries, President Al-Assad stressed." H.E. President Bashar Al-Assad upon receiving Iran’s First Vice President Es'haq Jahangiri and an accompanying delegation, January 29, 2019. "Relations between Syria and Iran are based on principles, morals and on respecting people’s will to determine their future away from foreign interference. Such an approach has contributed to perpetuating the independence of the two countries, and there is a need as to adopt this relationship as a base for creating a bigger network of relations particularly with the countries which agree with both Syria and Iran in terms of policies." H.E. President Assad upon receiving the visiting Head of the Iranian Parliament's National Security, and Foreign Policy Commission, MP Heshmatollah Falahatpisheh, January 14, 2019. "We received with deep sorrow the news about the terrorist attack against the military parade in the city of Ahvaz in southern Iran. On behalf of the Syrian people and on my own behalf, we express our warmest condolences to you and to the friendly people of Iran on the martyrdom of innocent people and condemn in the strongest terms this cowardly criminal act… the Islamic Republic of Iran has stood against terrorism in Syria and condemned terrorism in the entire world and it has always been honest to its principled and firm stance against takfiri terrorism. I reiterate Syria's full support for Iran in the face of the terrorist acts and hope that terrorism supporters and financiers would understand that terrorism danger threatens entire humanity everywhere, and ask them to reconsider their support for terrorism in different parts of the world." From President Bashar Assad's condolences cable to his Iranian counterpart Hassan Rouhani, September 22, 2018. "…the pressures put by some Western States on Syria and Iran would never derail them from their persistent defense of their principles and of the interests of their people as well as of the security and stability of the entire region." From President Assad's assertions during thetalks held with the visiting Foreign Minister of the Islamic Republic of Iran, Mohammad Javad Zarif and the accompanying delegation, September 3, 2018. There is "the importance of coordination between Syria and Iran and of drawing up long-term cooperation plans that enhance factors of steadfastness of the Iranian and Syrian peoples against threats and challenges facing them." "The only price they ask for is absolute hegemony, regardless of the issue and the place. Of course, we shall never provide that price; otherwise we wouldn’t have fought this war for years. We have been fighting for the independence of Syrian decision-making, for the Syrian homeland, and for the unity of Syrian territory. As for Iran in particular, let me be very clear: the Syrian-Iranian relationship is a strategic one not subject to a deal in the south or in the north. This relationship, in terms of its implications and results on the ground, is linked to the present and future of the region. Consequently, it is not subject to the price tags of the international bazaar. Neither Syria nor Iran has floated this relationship on the international political bazaar for it to be subject to haggling. The proposition was made by the Israelis with the objective of provoking and embarrassing Iran. At the same time, this comes in line with the international propaganda campaign launched against Iran regarding the nuclear file. It is not a separate issue; for everything happening now is linked to Iran in order to create an international position against it. As for us in Syria, the decision concerning our land is an exclusively Syrian decision. We are fighting the same battle, and when we have a decision concerning Iran, we will talk about it with the Iranians and not with any other party." "The term adviser is sometimes used in a broad manner, i.e. these advisers have been with us, through the longstanding relationship with Iran, even before the war, because the military relationship is close. When a military formation moves to a fighting position, the adviser becomes a fighter. So, the word can be used in different senses. There are certainly Iranian advisers in Syria, and there are groups of Iranian volunteers who came to Syria, and they are led by Iranian officers. Iran has fought with and defended the Syrian people. It offered blood. That’s why when we say “advisers” this is a generic term, but this doesn’t mean that we are ashamed of any Iranian presence, even if it is official. But we use the word “advisers” because there are no regular Iranian fighting units in Syria." "That’s correct. In fact, there was a scheduled visit to Iran a few months ago, and it was postponed and not cancelled. It was postponed because of an emergency in Syria related to the development of battles. There is certainly no reason which prevents such a visit, and I’ll visit Iran hopefully soon on the earliest opportunity. This is natural, but the issue is logistic, no more, no less." "The most important fact regarding this issue, is that we don’t have Iranian troops. We never had, and you cannot hide it, and we’re not ashamed to say that we have, like we invited the Russians, we could have invited the Iranians. We have Iranian officers who work with the Syrian Army as help, but they don’t have troops. And the starkest fact about their lies about this issue, the Iranian issue, that the recent attack a few weeks ago, they said that they attacked Iranians bases and camps, as they said, allegedly, and actually we had tens of Syrian martyrs and wounded soldiers, not a single Iranian. So, how could they say that we have it? So, it’s a lie. We always say that we have Iranians officers, but they work with our army, we don’t have troops." ''It is very important to bolster economic cooperation between Syria and Iran and all the countries which are committed to the defence of their sovereignty and independence. Such cooperation is one of the best means as to resist the Western schemes which use sanctions and imposed unjust economic measures as a means to siege and damage the people for subjugating them to the Western hegemony,'' . H.E. President Assad upon receiving the visiting Iranian Minister of Roads and Urban Development Abbas Akhoundi, May 18, 2018. "The support of Iran to Syria in all fields, particularly in the fight against terrorism contributed to the successes achieved by the Syrian Arab Army against terrorists." "I thanked President Rouhani and the Iranian people and government for their support to help the Syrian people triumph over terrorism, expressing confidence that Iran will be a partner in reconstructing Syria exactly as it was a partner in defeating terrorism." H.E. President Assad in a phone conversation with H.E. President Hassan Rouhani of Iran, November 25, 2017. "I hail Iran's stances on Syria and other countries of the region and praise its role in the fight against terrorism; this role hasn't satisfied some Arab League countries and made the League release unwise statements. Arab League doesn't, however, represent the Arab peoples, it only represents itself." "The victories achieved by the Syrian Arab Army in cooperation with its allies and back up forces in addition to the political stances of Syria and the allied countries, mainly Iran, have not only contributed to inflicting successive defeats upon the terrorist organizations, but also helped consolidate the international law and countries' right to defend their sovereignty, independence and territorial integrity and to prevent any party from interfering in their internal affairs." H.E. 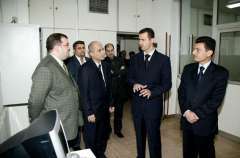 Assad upon receiving the visiting Iranian Assistant Foreign Minister for Arab and African Affairs,Hossein Jaberi Ansari, November 15, 2017. 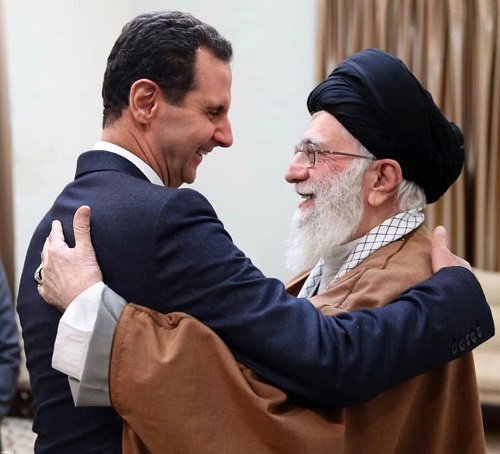 "In the beginning, I would like to congratulate in the warmest terms Your Excellency and the friendly government and people of Iran on the strategic achievements that the Syrian Arab Army has made with the cooperation of our allies and friends, in breaking the siege on Deir Ezzor city,"
President Assad's message to the Leader of the Islamic Revolution Ayatollah Seyed Ali Khamenei and the Iranian nation, September 6, 2017. "Syria believes that Iran, which has always contributed to the fight against terrorism, has a share in the recent victory- breaking a three-year siege imposed by the Daesh (ISIL) terrorist group on the city of Deir ez-Zor-, and praised the Islamic Republic for its “principled policies” in the war against terrorism and in supporting the Syrian people." "Damascus government, together with Iran, will keep combatting tyranny and aggression in order to overcome the threat of terrorism and take part in the establishment of a regional and international order on the basis on justice, equality and dignity for all nations." "We regard the Iranian people who have always dedicated their blood alongside us in the fight against terrorism as partners in this victory. Also, through Your Excellency, I express my deep gratitude to the Islamic Republic of Iran over its principled positions against terrorism and its support for our people to liberate our homeland's soil from the contamination of Takfiri terrorists,"
"The Syrian Arab Republic and the Islamic Republic of Iran are continuing the fight against oppression and aggression and eliminating the threats of terrorism." "In the name of the people of the Syrian Arab Republic, I bestow my highest gratitude to Your Excellency and the friendly nation of Iran, and ask God to make our steps firmer in the cause of the well-being of our two nations and the entire humanity,"
H.E. President Assad, July 20, 2017, upon receiving the visiting Iranian Assistant Foreign Minister for Arab and African Affairs Hussein Jaberi Ansari. "Syria is hand in hand with Iran in fighting terrorism in absolute and firm solidarity with Iran, people and government,"
President Assad in a phone call with President Rouhani, June 8, 2017. "The terrorists and their masters resorted to the heinous terrorist aggressions against Iran and to their self-created tools as to achieve political changes to their interests, because of their failure in weakening Iran and the Iranians in whatever means,"
"The Iranian presidential elections have presented the world with a leading example to be followed as being held in a high spirit of democracy and responsibility." From President Assad's congratulatory letter to President Hassan Rouhani on winning a second term as president of Iran, May 20, 2017. "Iran plays a constructive role through backing the Syrians steadfastness in the face of the terrorism war imposed on the Syrians as well in working for finding a peaceful solution in safeguarding for the sovereignty, territorial integrity and unity of the Syrian People,"
From H.E. President Assad's statements upon receiving a visiting Iranian delegation on January 26, 2017. "Iran and all countries which stand by the Syrian People are partners in the accomplishments achieved against terrorists." From President Assad's Statements to Iranian Delegation, January 4, 2017. 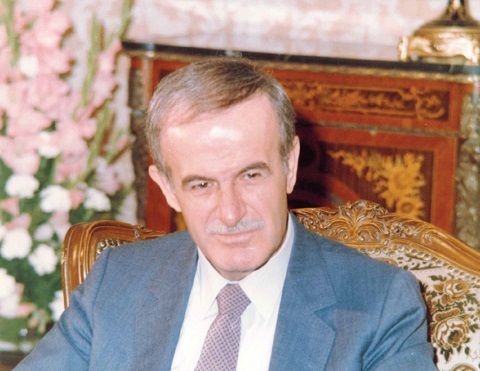 "the support provided by Iran to Syria politically and economically which greatly contributed to the bolstering of the Syrians steadfastness." "Of Course, and in detail. Iran is a state, and a state builds its policy on principles on the first instance but relations between states are not necessarily based solely on common principles. Certainly, there are no common principles between the Iranian state and the Muslim Brotherhood. But part of the role of the Iranian state in achieving stability in the region, is that it seeks to have relations in all directions, including with the Turkish state. Erdogan is affiliated with the Muslim brotherhood and his regime follows the same trend. Nevertheless, there is non-stop dialogue between Iran and Turkey. This does not mean that they have common principles and visions. But the positive aspect in this case is similar to the Russian-Turkish relation, i.e. trying to limit harm and damage. The same applies to the dialogue between Iran and the Muslim Brotherhood. It is an attempt to convince these groups perhaps to embrace political opposition and stay away from terrorism. Here we come back to the same point: we have no hope that they will change. They have been like this for eighty years, but we are not against any state or any power which tries to push this group away from terrorism, particularly that, in the nineteen eighties, there are groups which left the Brotherhood and abandoned violence. On the individual level, there are groups which came back to Syria and embraced the patriotic state, and lived and died in Syria. So, this is possible on the personal level, but hope remains limited." " It has many aspects. The first one, if you want to talk about the regional conflict, Syria has a good relation with Iran, and Saudi Arabia wanted to, let’s say, destroy Iran completely, maybe in the political sense and maybe in the material sense or factual sense, for different reasons. So they wanted Syria to go against Iran, that’s why destroying Syria could affect Iran negatively. That’s how I look at it. 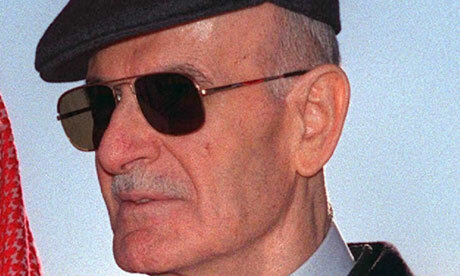 "But before the crisis, it wasn’t an offer; they wanted to use Syria indirectly. Not offer, they wanted to convince us to do something. The main issue was, at that time around the world, was the nuclear file of Iran. It was the main issue around the world, and Syria has to convince Iran to go against its interests, that time. France tried, Saudi Arabia wanted us at that time to be away from Iran with no reason, just because they hate Iran." "Now, the discussion continues between us and our Iranian brothers at the foreign ministry in order to take into account this important change, so that it becomes not necessarily part of the Iranian initiative, but to make the initiative compatible with these important and positive changes on the Syrian arena, and probably on the Syrian-Iraqi arena. That is why I say that this initiative is very important and necessary, particularly after signing the Iranian nuclear deal, and with European officials starting to communicate with Iran. 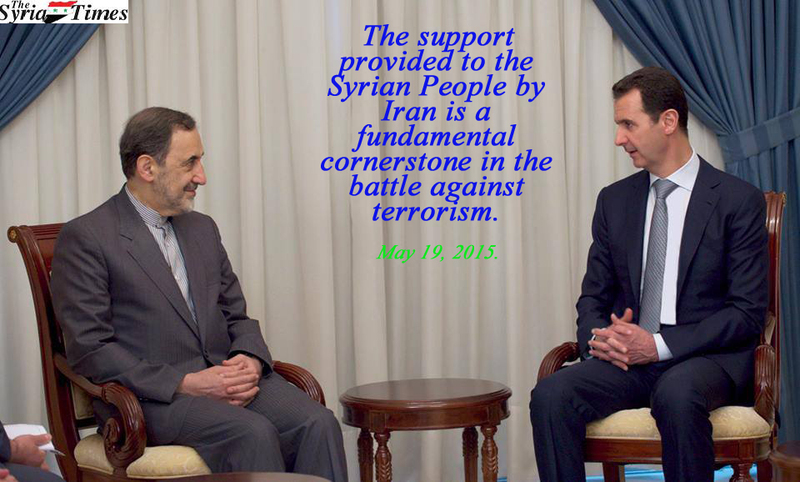 We believe that the Iranian role has become important for us in Syria through this initiative. Of course, when it is complete the details are integrated, it will be announced." "It has a tremendous impact, not in the way some people see it in terms of Iran’s technical, scientific or political capabilities. It has a great and extensive impact on all developing countries, because Iran is a developing country which has broken the knowledge blockade imposed on developing countries in order for the West to monopolize knowledge in certain areas, particularly that oil resources are being exhausted, and the future becoming dependent on nuclear energy. On the other hand, you and we are strategic allies; so if Iran is stronger, Syria will be stronger, and vice versa. From another perspective, had Iran abandoned its rights in the nuclear file, that concession would have been used as the new standard which will be applied to other countries, regardless of the legitimate international right of all countries to obtain nuclear energy. In the future, Syria or any other similar country might need nuclear energy." "What Iran has won by its steadfastness and through the intelligence of its negotiators will be applied to all these other countries in the future. What you won, we have won as a developing country. That is why this is a very important aspect. The final aspect is that related to the crisis. Acknowledging the real weight of Iran and its regional role will give it an opportunity to use its increasing influence to persuade the West that their policies are wrong. Of course, I do not pin, nor do you I believe, great hopes on the West changing its colonialist world view and moving in the right direction, but any effort made by Iran must have its impact. This impact, even if it were limited, would accumulate in time in order to mitigate the damage inflicted on our country by the colonialist West, practically now in relation to the situation in Syria and through your renewed relation with the European countries." "When we are independent, we cooperate first politically, economically and militarily. Of course, we have been able to achieve the best in cooperating politically during the past three and a half decades, since the success of the Iranian Revolution. But I believe that we have not done enough economically, despite the conditions in which Syria lives. I believe this is an important area, and this is what I discussed with Iranian officials. The crisis itself might be an opportunity, particularly in light of the Western sanctions against Syria, for economic relations to develop between us and Iran. There are also military relations which are old and go back to the same period. They are advanced relations and we cooperate in detail with Iran on military issues. So, it is a comprehensive cooperation in all areas, but as I said, priority is given to the independence of decision-making in the region and preventing more countries from falling under Western hegemony." "First, the relationship between his imminence, the Supreme Leader, and me is a brotherly relationship despite the difference in years between us. It is a genuine brotherly relationship. He is possessed with special attributes in terms of clarity and adherence to principles. These are the things you look for in any politician; and I believe these are the attributes which are in harmony with Iranian policies and the Iranian people’s adherence to principles. They provided a new model in the possibility for states to maintain their principles and interests at the same time based on principles and not on short term political tactics or opportunistic political tactics. This is what his imminence, the Supreme Leader, provided during the Syrian crisis. I’m also talking about Iranian policies before that; because the current policy is a continuation of the policies of Imam Khomeini who also embodied the adherence to principles. This has been the shape of Iranian policies since the revolution, with one difference only: the fact that they developed continuously to meet the needs of the times. They are based on the same principles but they always have more developed manifestations. In fact Iran’s support to Syria is based on a popular position now; but his imminence, the Supreme Leader, has an essential role through his directives to Iranian institutions; and we are familiar with the details of these directives in terms of the mechanisms of supporting the Syrian institutions in order to support Syria in her ferocious war against terrorism and the countries which support it." "The Iranian people are principled. And the second word is loyalty, for the Iranian people have been loyal to Syria which supported Iran when it went through war for eight years. That war had the same objectives which they want to achieve in Syria today, but in a different form, using different tools and under different international circumstances. The Iranian people and leadership have not forgotten Syria’s position at that time. When most countries of the world tried impose sanctions against Iran, Syria was, I don’t want to say the only state, but one of the few states which stood by Iran, but it was the clearest in its position. Today, whenever we meet any Iranian individuals they talk about Syria’s role at that time. Today, Iran pays back loyalty with loyalty, truthfulness and transparency. On the other hand, the Iranian people have a certain vision and a certain methodology which actually led you to the nuclear deal. When you see things clearly, enemies and opponents cannot deceive you." "This vision for the region in general, including Syria, and including Iran’s future and also the future of the region is very important for the stability which we seek in the coming decades. These characteristics are very important, and I talked a short while ago about patriotism, about the patriotic model provided by the Iranian people. I cite a simple example: when they started their attempts to stir unrest in Iran, it was the first country in which they wanted to implement the regional model through the 2008 elections. I met a number of European officials who told me that the Iranian state will fall soon. Of course they say “regime” and not “state”, because they do not recognize our states or peoples. I used to say no, these movements will fail. And Iran, the Iranian society, people and state were able to isolate this limited attempt, and all other attempts failed. Unfortunately, this succeeded in other countries of the region. These are patriotic models: the Iranians uniting around the nuclear file despite the different political currents in Iran. There are national issues around which you unite. I believe that all these attributes represent the Iranian people." “Was Syria presented as an offering? Certainly not, but we could say that Syria made offerings,” the President elaborated, saying that when one’s allies are strong, that makes you strong, and when they are weakened, you are weakened as well, but saying that Syria’s steadfastness led to the nuclear deal is an oversimplification as the deal is the result of a long process began by the Iranian people a long time ago, with Iran withstanding pressure for 12 years and holding fast to its principles throughout the negotiations during the past two years." "Iran now has more prospects to play a bigger role in it, and Iran’s strength will strength Syria, and in the same way Syria’s victory will be a victory for Iran." "Syria and Iran share viewpoints and have mutual principles, and they form the axis of resistance, and so the principles will not change; only some tactics may change, or maybe some results on the ground." "The support provided to the Syrian People by the Islamic Republic of Iran is but a fundamental cornerstone in the battle against terrorism." "The same relation that we could have described 35 years ago since the Islamic revolution in Iran in 1979, when Syria stood by that revolution, supported it while many countries, but mainly the West and the Gulf states, stood against it, then later Saddam Hussein attacked Iran and we supported Iran. Now, Iran supports Syria. So, it’s a mutual support which is actually an alliance. So, it’s an alliance. That’s how I can describe it." "Iran never tried to control my country. Never. And the Syrian people, by nature, they won’t accept anyone to control their country. So, when Iran supports Syria, that doesn’t mean it controls, doesn’t mean it tries to impose what it wants on the Syrian government. What you say, we couldn’t survive without Iran and Hezbollah, this is a hypothetical question for one reason: sometimes small support in a big war will lead you to bigger results, in any war or any conflict, will give big results. So, whether this support is small or big, it has given a result, we cannot deny this, and their position, supporting Syria, was vital for us. But how was it without their support is difficult to tell. It must have been more difficult, but that doesn’t mean that we couldn’t survive." "Iran is an important country to our region. It’s a big country, it’s a developed country, proportionally, at least. But that influence, I would look at it in a positive way, because Iran is a country that seeks to have more stability, for its interests. Any country has interests. So, it is influential, but in a positive way." 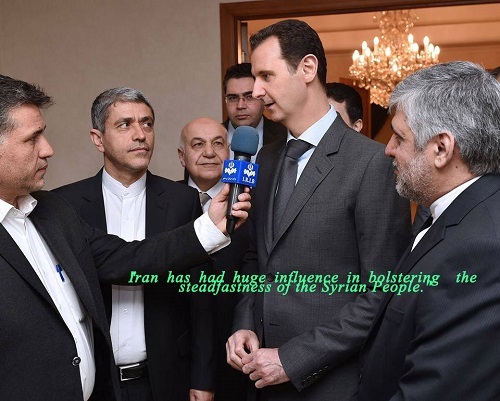 "Iran has had huge influence in bolstering the steadfastness of the Syrian People." President Bashar Al-Assad, March 16, 2015.
" Iran is an important country in this region, and it was influential before the crisis. It’s influence is not related to the crisis, it’s related to its role, its political position in general. When you talk about influence, various factors make a particular country influential. In the Middle East, in our region, you have the same society, the same ideology, many similar things, the same tribes, going across borders. So those factors are crossing the borders. If you have influence on one factor, your influence will be crossing the border. This is part of our nature. It’s not related to the conflict. Of course, when there is conflict and anarchy, another country will be more influential in your country. When you don’t have the will to have a sovereign country, you will have that influence. Now, the answer to your question is, Iran doesn’t have any ambitions in Syria, and as a country, as Syria, we would never allow any country to have influence our sovereignty. We don’t accept and the Iranians don’t want it either. We allow cooperation. But if you allowed any country to have influence, why not allow the Americans to have influence in Syria? That’s the problem with the Americans and with the West: they want to have influence without cooperation." From H.E. President Al-Assad interview with al-mayadeen TV, October 21. 2013. From H.E. President AL-Assad’s Rai News Interview, September 29,2013. From H.E. President Al-Assad interview with TeleSUR TV, September 26, 2013. From H.E. President Al-Assad interview with CBS News, September 9, 2013. From H.E. President Al-Assad's interview with Le Figaro, September 3, 2013. From H.E. President Al-Assad's Interview with Argentina's Clarin Newspaper and Telam News Agency, May 18, 2013. From President Al-Assad's Interview with the Turkish TV channel Ulusal Kanal and Aydinlik Newspaper, April 2013. From H.E. President Bashar Al-Assad's interview with Russian TV, RT, November 9, 2012. From H.E. President Al-Assad's interview with Iranian TV, June 28, 2012. From H.E. 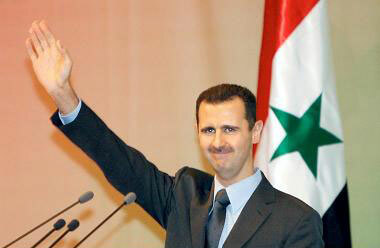 President Al-Assad interview with Wall Street Journal, January 31, 2011.
'' In logic, no, but you know that reason and logic do not necessarily run the world; however we do not expect, because the outcome of a military action will lead only to more disasters that not only the region, but also the whole world will pay the price. Logically speaking, there is no military strike. There is intimidation and a psychological war. They did the same with Syria. We were threatened continuously during the past years, particularly after Iraq war in 2003. But this doe not rule out a stupid action, and then all sides will pay the price." “I am skeptical about that skepticism. It raises the suspicion that the West is motivated by a different agenda, that it doesn’t want to solve this issue. The region is following these developments with anxiety because the measures that will be imposed on Iran will be imposed on others as well. You see, the future of energy is nuclear, besides the renewable sources. One day, I will have nuclear energy, at least to produce electricity. It is my right, guaranteed by the Non Proliferation Treaty”. “In politics, many things are said. But it is the actions that count. If Iran truly wanted the destruction of Israel, then why did it support our peace negotiations in 2008 with Israel, mediated by Turkey? Actually, the Iranians are more moderate than many want to see”.
" I have never heard from any Iranian official during three decades that they are against the achievement of peace or against the return of territories or against the peace process and during the indirect negotiations in Turkey Iran expressed support to Syrian in these negotiations." Imposing sanctions [on Iran] is a problem because they will not stop the program and they will accelerate it if you are suspicious. They can make problems to the Americans more than the other way around. If I am Ahmadinejad, I will not give all the uranium because I do not have a guarantee [in response to American and European insistence that most of Iran’s low-enriched uranium be sent abroad for further enrichment to make it usable for a research reactor, but not for a bomb]…. So, the only solution is that they can send you part and you send it back enriched, and then they send another part…. The only advice I can give to Obama: accept this Iranian proposal because this is very good and very realistic. "Iran is an important country, like it or not.” ” ... with Iran, I'm ready to mediate." "If instead we're talking about facilitating dialogue with Tehran, a concrete proposal is needed to give to that government. Until now, I've only received an invitation to play a role. Agreed, but that's not enough,"
"What's lacking is a plan, rules and specific mechanisms to put forward to Tehran." "As a signatory to the Nuclear Nonproliferation Treaty, (Iran) has the right to have peaceful reactors,"
"I would say to Obama and the Europeans: 'Don't waste your time on this. Go and make dialogue.' The only way is to go for direct engagement." "Iran is an important state in the region and its role is necessary for the region's security, in integration with the Arab role and not as an alternative,"